Sean McConville thinks Accrington Stanley have had the upper hand on Sunderland this season. The Stanley winger, who is likely to start in tonight's clash at the Wham Stadium, has featured in the previous two meetings between the pair. December's encounter in Hyndburn was postponed with the scoreline poised at 1-1 before Accrington took a two goal lead at the Stadium of Light in February, though the Black Cats fought back to earn a point. Interestingly, McConville believes his side have been the better team on both occasions. “We have been talking about it, it’s a massive game, we have got to turn around the situation we are in,” said the 30-year-old. “We couldn’t have asked for a better game really, a massive team which will bring a massive crowd and we can’t use any excuses that we can’t get up for the game. "We have got to be on the front foot from the off and this should suit us. 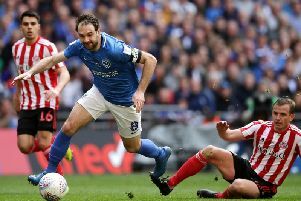 “They are coming off a disappointing result on Sunday in the Checkatrade Trophy final and the last place they would probably want to come to is Accrington - so we have got to try and make this work in our favour. “We have played them twice, once abandoned, and I think we were the better side on both occasions. We can take heart from these performances against them."